A regional party in Germany is flexing its muscles and shifting the country's politics significantly to the right. Is Angela Merkel’s supremacy coming to an end? German politics doesn’t seem to be following the usual rules. Having just reached one hundred days in office, last week the new coalition government seemed to be teetering on the brink of collapse. Perhaps rather predictably, the immediate trigger for the crisis centered on immigration. Germany’s interior minister Horst Seehofer, a member of Bavaria’s center-right CSU, announced that he had drafted an immigration “master plan” designed to establish stricter laws to “secure” the country’s national borders. Yet his sixty-three-point plan long remained unpublished, and his party, like Angela Merkel’s CDU (with which it has long had a national power-sharing agreement) and their common coalition partner, the Social Democrats, knew little of what he was proposing. The only thing observers managed to learn from the flurry of government press conferences held on the topic was that Merkel would agree to sixty-two-and-a-half points from Seehofer’s “master plan.” The half-point discrepancy owed to the question of whether refugees already registered in other EU countries (such as Italy or Hungary) could cross the border to Germany and apply for asylum. 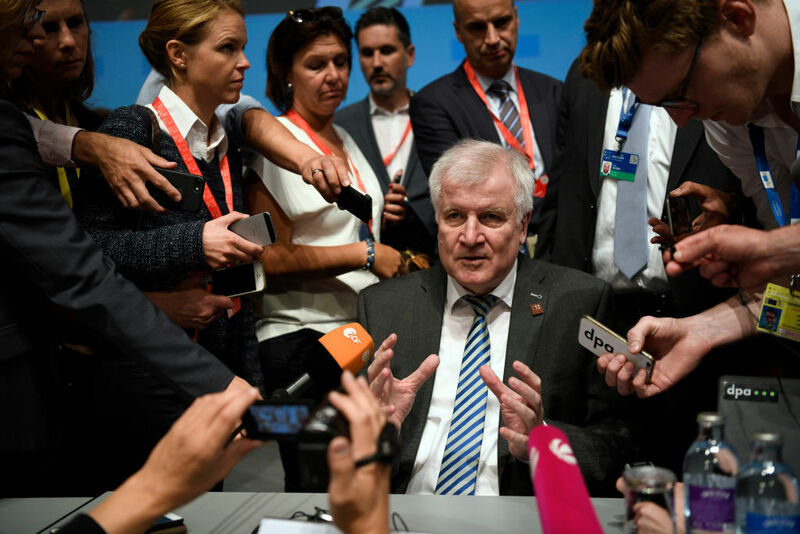 Seehofer received strong backing from his party for tightening border controls, while Merkel and her CDU colleagues continued to advocate for a “European solution” — which above all meant bilateral agreements she hoped to arrange at the European Council summit. Seehofer gave her a deadline: if she did not deliver results, he would implement the “master plan” independently. It became clear during the summit that some states were not willing to take back refugees or reach a common European agreement. All EU agreements are voluntary, including ones on erecting camps at its external borders or in North Africa. Important countries like Hungary refused to take back refugees either way. Seehofer threatened to resign in response, as Merkel’s European agreement would not have the “same effect” as his plan. Seehofer’s political gambit placed the entire government on the line: the backbone of mainstream German conservativism which has held fast since 1949 and only been broken once in postwar history, the parliamentary alliance between the CDU/CSU now threatened to split. How did it come to this? The trigger for taking such drastic action can be explained by the upcoming elections in the state of Bavaria, which the regional CSU has ruled without interruption since the founding of the Federal Republic after World War II. Should the party lose its majority in Bavaria, their claim to having three ministers in the federal government would also lose legitimacy — putting the important position of interior minister at risk, among others. In this sense, everything is at stake, as the party’s strength is increasingly challenged from the right by the Alternative for Germany (AfD), whose positions and members run the gamut from right-wing populist to outright fascist. Why, indeed, should anti-immigration voters support the CSU when a louder law-and-order, anti-immigration party is available? For this same reason, leading figures in the CSU are practically competing with one another to prove who is more authoritarian, as Bavarian minister president Markus Söder mandates crucifixes in all public buildings and introduces a draconian new police law that has been widely criticized from various sectors of civil society. The situation is further complicated, however, by the fact that the CSU can now count on support for its position from other European governments. It was no coincidence that the fascist-sounding phrase “Axis of the willing between Rome-Berlin-Vienna” was used during Horst Seehofer’s recent meeting with Austrian chancellor Sebastian Kurz. Seehofer is also cozy with other right-wing leaders, happily meeting with Hungarian prime minister Viktor Orbán and congratulating Italian interior minister Matteo Salvini on his recent victory. Their common interest in the “sovereign nation-state” has allowed Seehofer to form an alliance against his own chancellor. Though Merkel possesses what the Germans call “Richtlinienkompetenz”, i.e., the ability to set policies against the wishes of other members of her government, she increasingly has to bend to pressure from both within and outside her own party. It is notable that local CDU organizations in the eastern states and in the party’s youth organization also lean towards Seehofer’s positions. In fact, it would appear that behind her in the ranks, many are already awaiting her departure. The pressure from without is greater, however, because many other EU nations no longer accept her “European” policy, seeing it as essentially serving German interests. In short, today there is immense political pressure bearing down on Merkel. As expected, a compromise was ultimately reached to resolve the “government crisis,” largely because snap elections would most likely have benefited the AfD at the expense of all other parties in government. Seehofer withdrew his resignation gambit; indeed, his threats had worked. In the end, an agreement was reached to establish “transit centers” on the German-Austrian border, designed to “intercept” refugees who, by necessity, arrived via other EU countries and were initially registered there. Random police checkpoints in border areas are also to be extended. After initial hesitation, the Social Democrats also agreed, after removing some of the agreement’s most draconian wording. Germany, it seems, will close itself off and build refugee camps. Austrian chancellor Kurz responded by announcing his intention to better “protect” Austria’s southern border — thereby shifting the border even further south and leaving it up to Matteo Salvini to decide what will happen to refugees in the Mediterranean. The near-certain result is further humanitarian catastrophes. Looking at the situation in global terms, the lines of division are bigger than just half a point out of sixty-three. At least for now, the question of the nation-state is exercising all of Germany’s parties — not only the CDU and CSU, but also the socialists of Die Linke and the liberal Free Democrats (FDP). At what level can migration be controlled? How should the welfare state function under conditions of transnational capitalism? How do relations between states change amid the renewed threat of war? These questions are becoming increasingly pressing across the political spectrum. In a recent address to parliament, SPD leader Andrea Nahles summed up the problem: for Germany, the question is whether it will position itself “in real competition with China and the US.” Merkel nodded wearily — the phrase could just as easily have been her own. So far, Germany has been one of the biggest winners of the multilateral liberal order. Merkel has acted rationally by pushing for both multilateral agreements and “German interests” simultaneously. She speaks of a community of values, but means above all else economic interests — interests which align quite well with other liberal or progressive values she has adopted in recent years, and which can even merge into a powerfully effective union (what Nancy Fraser calls “progressive neoliberalism”). In contrast, the CSU sees “German interests” in terms of the state political order and is thus closer to the many authoritarian and right-wing governments in Europe and beyond. Nor is it merely a question of sixty-two-and-a-half points: the entire liberal multilateral order, for which the German chancellor has more than anyone else stood as a powerful symbol these last twelve years, is at stake. As this order falters it undergoes a crisis of hegemony, becoming increasingly apparent as the previous mode of governance proves increasingly incapable of creating consensus or forging stable coalitions. Some ten years after the last major economic crisis, we continue to witness its economic repercussions. The EU, as an economic union with free movement of goods, finance, and people, is lapsing into a crisis of legitimacy, combined with the erosion of the institutions which acted as the guarantors of order. For most Europeans, this order has chiefly meant technocracy, growing inequality, and industrial decline — which many UK citizens, for example, confirmed with their vote for Brexit. In its own way, Donald Trump’s presidential victory is another expression of the collapse of the liberal order: rather than bothering with international frameworks, he purports to cut “deals” with other heads of state like a businessman would with other businessmen. This crisis of hegemony is particularly evident in the crisis that now faces the German chancellor. Her position appears more fragile now than ever, and in the medium term she will likely have to find new coalition partners in the SPD and the Greens in order to maintain a pro-European consensus built around German economic might. For now, it seems that the CDU/CSU alliance will hold. Yet Seehofer continues to issue threats that his presence in the coalition depends on Merkel following through with her immigration promises. Underlining how far to the right he is willing to go, on Tuesday, his sixty-ninth birthday, he jokingly observed that sixty-nine refugees whose petitions had been rejected were deported back to Afghanistan, implying that this represented the fruit of his political wrangling. Even if the alliance holds, it is by no means certain that the current governing constellation will last an entire term. CDU/CSU together lack an absolute majority in the national parliament, which has forced them to enter a series of grand coalitions with the Social Democrats in order to stay in power. This has proven relatively workable as long as Merkel stuck to largely centrist positions barely distinguishable from her colleagues in the SPD. Seehofer’s power play puts this balance into danger. For the CSU, all that matters is Bavaria. The party, appealing to Bavaria’s Texas-like self-image as a culturally unique and independent state in Germany, does not contest elections anywhere else and is generally to the right of the CDU. In order to save its own regional skin, it may at some point prove more opportune to cut loose from the CDU and focus on maintaining its hegemony over Bavaria, leaving Merkel to govern with other mainstream parties or call snap elections. On the other side of the parliamentary aisle stands Germany’s ambivalent opposition: on the one hand, Die Linke, who see the European Union as an embodiment of unfettered capitalism and call for its fundamental transformation, if it is to work for people and not for capital. On the other, the Right sees state sovereignty being jeopardized by unrestricted migration and therefore attacks the EU. The FDP is divided: though they are traditionally free-marketers, they still believe in “securing” the national borders. Therefore, it is possible that a coalition of national-conservative and economically liberal forces could emerge in Germany as it already has in Austria — but not without overthrowing Merkel. This possibility also depends on whether the far-right or the liberal-economic wing prevails in the AfD’s internal power struggles. So far, only Die Linke is calling for social-welfare policies and a restructuring of Europe, and its only chance is to place this unique position front and center. Rather than reduce debate to the tiresome immigration issue, it could focus on other problems such as the lack of investment in public goods like education, health care, and housing. Increasingly, however, this is easier said than done in a political climate shaped by the Right. Whether the Merkel era continues or ends will depend first of all on the coalition partners she works with in the future, and whether right-leaning forces within her own party can lead a successful rebellion against her. Should they indeed succeed, the question of Germany’s — and Europe’s — future will be left wide open. Ines Schwerdtner is the editorial coordinator of Das Argument and an editor of Ada Magazin. Zachary Murphy King is a writer and translator based in Berlin.